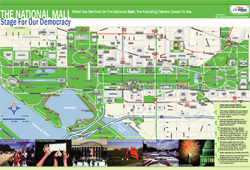 This is the first interpretive map to tell the history of the Mall's public open space. 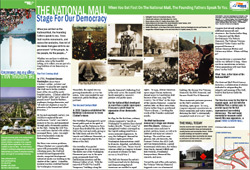 Based on the work of the National Mall Third Century Initiative, its essential theme is that the nature of the Mall changed in the 20th century. It became the stage for our democracysite for civil rights demonstrations, July 4th fireworks, Annual Folklife Festival, Presidential Inaugurations, and more. Millions of Americans come to the Mall each year to protest, petition, honor, as well as to celebrate and enjoy our nation's heritage. These files may take time to load. Please be patient. 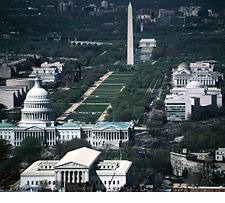 Here you can explore the full extent of the Mall from the Capitol to the Lincoln Memorial. Locate museums and memorials, learn about their hours and collections, connect to relevant websites, and print out a custom map for your next visit. For instructions on how to use this map, including a short interactive demonstration, click here and then click on the ? in the upper right corner.